A screen capture of the video taken by Indianapolis resident Shayne Holland after he says he was racially profiled by an off-duty police officer and told to leave his apartment pool. INDIANAPOLIS – For the past 17 months, Shayne Holland has enjoyed being a tenant at the River Crossing at Keystone apartment complex on the northside of Indianapolis. He is fond of the friendly neighborhood, the close proximity to his job and the fact that living there puts him just a short walk away from some of his favorite eateries in the city. But on Friday night, what he expected to be a relaxing evening at his apartment pool turned into a viral on-camera verbal altercation with an off-duty police officer, claims of racial profiling and an apartment manager being placed on administrative leave. Holland said the incident started after he got done working out at the fitness center of the complex. He said he was relaxing in a pool chair when an off-duty Indianapolis Metropolitan Police Department officer who was working security approached him and asked him if he lived at the complex. The name of the off-duty officer was not immediately available. "I had my headphones when she approached me so I didn't hear her the first time. When I asked her to repeat herself, she asked if I lived in the neighborhood. I said yes," Holland said. "When she asked where I lived, I said I don't know you and you haven't identified yourself, so I'm not just going to give you my address." Holland said he then presented his complex-issued key, which grants him access to the pool area, and told the officer she was welcome to test it and make sure that it worked as proof that he lived there. The officer then contacted the apartment office to further confirm Holland's residency. That is when Holland started using his cellphone to record the interaction. The apartment manager arrived, and Holland assumed the conversation would end then and there. He noted that he knows the manager well and had developed a positive rapport with her. In the video, Holland and the manager can be heard casually greeting each other by their first names. The manager can also be heard telling the officer that Holland does live there. Holland said he thought the situation would end there. "I thought the ordeal would be over ... obviously that wasn't the case and I was told to leave anyway. Obviously I was frustrated and I do feel like I was profiled." In the video, Holland says that the officer did not approach anyone else at the pool. The situation escalates from there. In the video, Holland repeats that he was uncomfortable giving the officer his home address because he doesn't know her. He then asks why he had to leave after the manager confirmed for the officer that he was a resident. He notes that he's paid $1,600 in rent for the next month. "Why do I need to give this lady, who I don't know, my address?" Holland asks in the video. Later he says, "Why do I have to leave my pool?" The manager responds by saying that Holland was being told to leave because he refused to answer the officer's question. When Holland again holds up his key as his form of proof, the officer can be seen in the video taking it out of Holland's hand. Alex Stokely, vice president of Barrett & Stokely, the company that manages River Crossing, told The Indianapolis Star that the apartment manager has been placed on leave in the wake of the videos, which have been viewed more than 30,000 times on Twitter. Stokely added that the company takes these kinds of situation very seriously, and that an internal investigation is being conducted. "That (investigation) includes talking to the employee and talking to the resident to get their point of view," Stokely said. "Once we've finished our internal investigation, we'll decide if she continues to be an employee or if she's terminated." Stokely also explained that officers were on-site because of an unrelated incident days earlier that involved police being called to the complex in response to a large number of people who did not live at River Crossing using the pool and refusing to leave. "The police there were to ask everybody there the same question as far as confirming that they did in fact live there or were guests of someone who lived there," Stokley said. Holland also said that no call was placed to the IMPD because the officer was at the complex working security while off-duty. As of Wednesday morning, no formal complaint had been filed against the officer, and IMPD was not investigating the situation. Holland's case is the latest in a rash of viral incidents that involve black people being confronted or reported to the authorities for ordinary, non-criminal activity. In each case, the party accused of profiling has earned a nickname to identify them on social media. 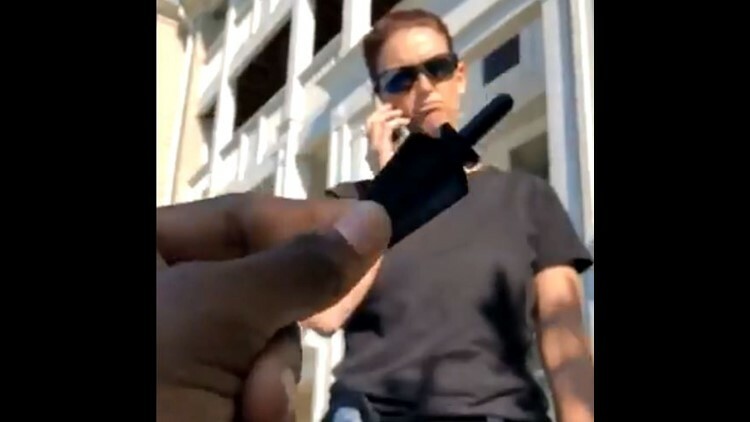 The Indianapolis incident follows "ID Adam" in North Carolina who questioned a black woman and her son about using a pool and demanded identification; "Pool Patrol Paula" in South Carolina who is accused of striking a 15-year-old black teen and telling him he didn't belong at a pool; "Permit Patty" in California who threatened to call the police on an 8-year-old black girl selling water; and "BBQ Becky" in California who called the police on a group of black people having a barbecue at a park. That significance isn't lost on Holland. He hopes that the way he handled the situation may lead to positive change and help others placed in similar situations remember to always keep their cool. "It's extremely frustrating. I'm from the inner city; I'm from a place where we didn't have a pool in the neighborhood. Now that I'm at an age and a place where I can afford to attain that, I still have to deal with being profiled," he said. "I feel like more and more people in 2018 are comfortable telling young African-Americans what they should and should not be doing." Holland also feels that the officer was trying to provoke him into a more extreme response by taking the key from him. "As a man, I feel like when someone snatches something out of your hand, it natural to want to react," he said. "But I felt like if I moved, anything she felt that was an aggressive or threatening ... she could have used force on me. And that would have been the worst-case scenario. "(The property manager) and the police officer both had the authority in the situation, but they didn't use it correctly. That is what we complain about." Despite the altercation, Holland said he doesn't plan on leaving River Crossing anytime soon. He said Wednesday morning that he had a positive meeting with Stokely and is waiting to see how the investigation unfolds. "Mr. Stokely, he understood my point of view. ... He told me there was no reason I had to be removed from the pool."